With spring in full bloom, hummingbirds can be spotted across the Bay Area flitting from flower to flower and lapping up the sugary nectar inside. These tiniest of birds have the highest metabolism of any warm-blooded animal, requiring them to consume their own body weight in nectar each day to survive. But it's not just an extreme appetite that sets hummingbirds apart from other birds. These avian acrobats are the only birds that can fly sideways, backwards and hover for long stretches of time. In fact, hovering is essential to hummingbirds’ survival since they have to keep their long, thin beaks as steady as a surgeon’s scalpel while probing flowers for nectar. Hummingbirds don’t just hover to feed when the weather is nice. They have to keep hovering and feeding even if it’s windy or raining, a remarkable feat considering most of these birds weigh less than a nickel. To find out how the birds do this, in 2010, biology professor Robert Dudley and post-doctoral researcher Victor M. Ortega brought hummingbirds into the Animal Flight Laboratory at the University of California-Berkeley for a closer view. 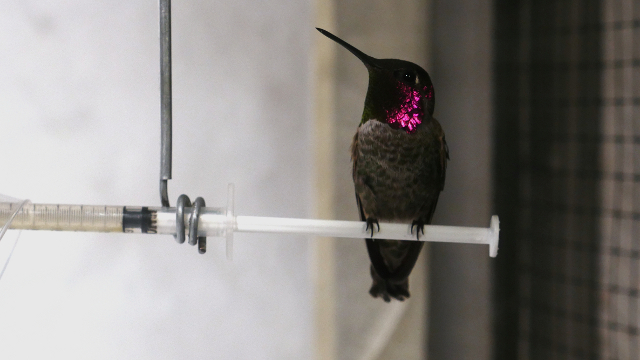 The researchers worked with Anna’s hummingbirds, a species that can be found year-round in the Bay Area, which they caught on the Berkeley campus and later released. First, the birds had to be trained to feed from an artificial flower – a syringe with plastic petals around it – filled with sugar water, a substitute for flower nectar. Then the birds were moved into a wind tunnel inside the Animal Flight Laboratory. The researchers could control the wind speed, subjecting the birds to speeds of three, six and nine meters per second –roughly 7 to 20 miles per hour. As the birds flew into the direction of the wind to feed from an artificial flower, a high-speed camera filmed their flight from top and side views at up to 1000 frames per second. Hummingbirds’ wings can beat up to 80 times a second – too fast for the naked eye to see. So by filming them with the high-speed camera, the scientists could capture in super-slow motion how the birds used their wings, tails and bodies to hover in windy conditions. The videos showed that the birds were still able to fly steadily, even in windy turbulence. To adapt, they twisted and turned their tiny bodies in the direction of the air flow, and used their wings for control and their tails like rudders to stay steady. The hummingbird’s gyrations in the wind tunnel resembled a kind of aerobatic dance that also burned up more calories when the bird had to fly into turbulent winds to get to the nectar. Ortega and Dudley performed another experiment with Anna’s hummingbirds, but this time they wanted to see how they responded to rain. They placed each bird in a Plexiglas cube and, using a water spray nozzle, simulated a light rainfall that they turned on when the bird either hovered to feed or rested on its perch. Again, a high-speed camera recorded the bird’s movements, but this time, to the element of rain. When the 500 frames-per-second video was played back, the scientists observed that rain didn't keep the bird from feeding. When it finished, the wet bird flew backwards and vigorously shook its body while rotating its wings in the opposite direction – in mid-air, no less. “They shake their bodies like dogs while still flying, but they don’t lose control,” said Ortega. And for birds that weigh only weigh a few grams, even a few drops of rain clinging to feathers add extra weight that can make it tough to hover in pursuit of food. 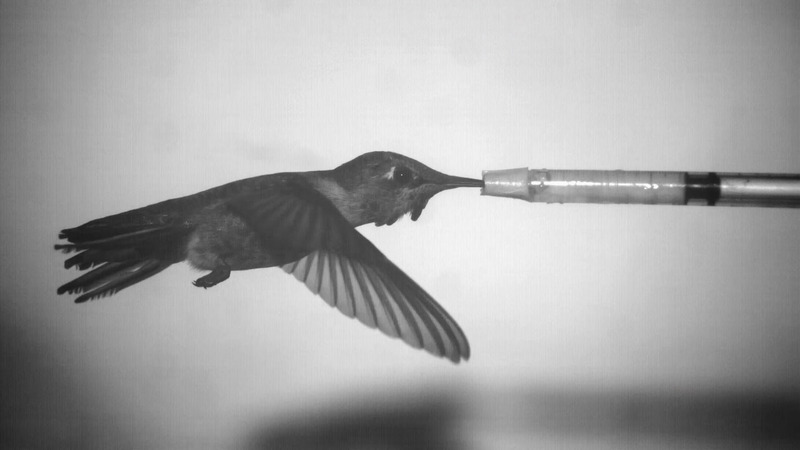 But how would hummingbirds perform when they had to fly sideways during turbulence generated in the wind tunnel? Ortega hopes to find out when he runs the experiment later this year or next.